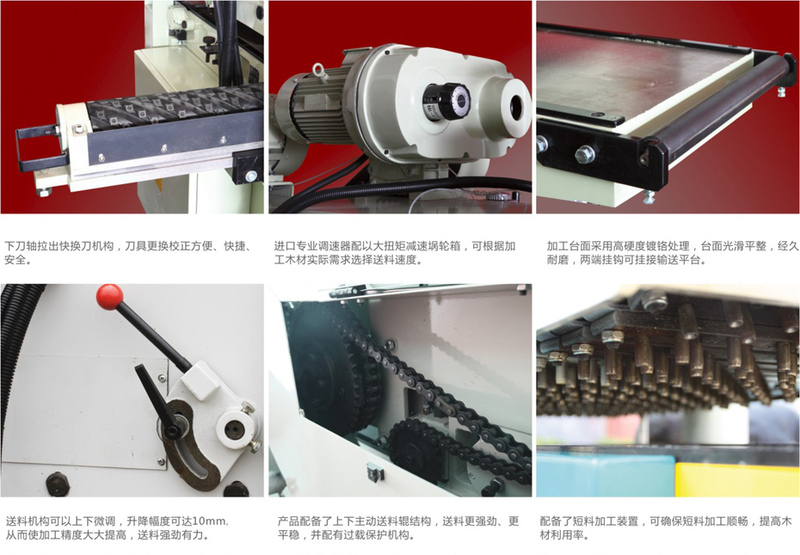 F,H type double sided planer :Has good shock absorption, stability of cast iron, with CNC machining center a process, provide a good foundation for the cutter shaft and the spindle feeding. After special processing, import bearings with high precision, provide a very healthy heart for the whole;The electrical components imported, so the control of sensitive security products imported from Italy. Equipped with digital display device, can be directly on the operation panel to operate machining thickness, precision can reach 0.1mm, H series inverter control feeding speed; the working table by special treatment, wear resistance and smooth. Jinhua strong panel furniture machinery Co., Ltd.
Company Name： Jinhua strong panel furniture machinery Co., Ltd.
Company Profile：Jinhua qianghong Furniture Machinery Co. Ltd. (Jinhua strong Woodworking Machine Co. Ltd.) is a national medium-sized enterprises, provincial advanced enterprise, advanced enterprise, science and technology. The company has passed ISO9001-2008 quality management system certification and CE certification, is the production of &quot;strong&quot; brand series of woodworking machinery products professional production base.